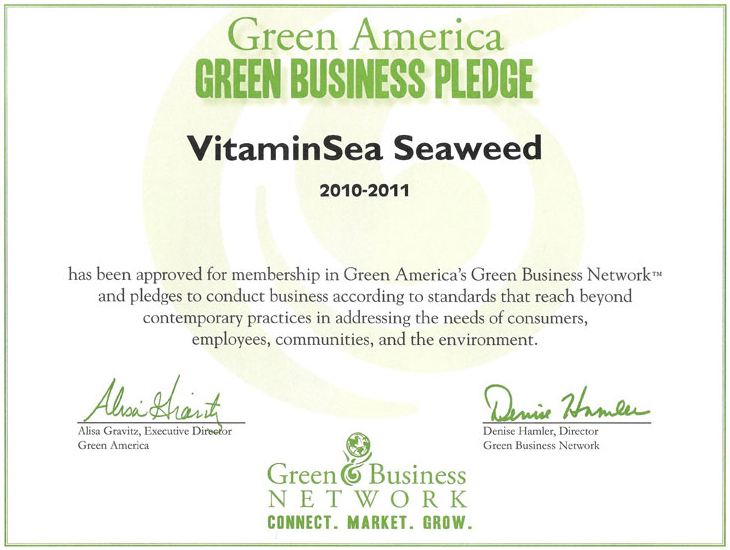 VitaminSea Seaweed is a small, family-owned company. We’ve been involved in the marine industry for more than 25 years and live and work on the ocean, harvesting and creating healthy, nutritious products from seaweed. The ocean is part of our world, and the more we research and learn about seaweed, we have come to realize that it is the most powerful plant on earth! Our seaweed is organic, nutritious, contains antioxidants, calcium and several vitamins, and is perfect for anyone following a vegan, vegetarian, macrobiotic or raw diet, although ANYONE can experience the health benefits from consuming seaweed. We harvest, process, and package all of our own products. Our seaweed is hand harvested by us, and our own licensed harvesters. We work year round to provide our customers with the freshest quality products available. Everything we manufacture comes from live ocean plants, straight out of the cold pristine waters off the coast of Maine, not from seaweed that washed up on shore. We ensure that all seaweed we use is naturally sun dried to retain all of its nutrients at the highest possible level. Seaweed is a non-pollutant, renewable and when harvested correctly, a sustainable resource. We need to use what the earth has given us. For millions of years, plants (especially ocean plants, which are the oldest) have adapted to their surroundings. They have developed defense mechanisms, such as storing water during droughts, secreting sunscreens to protect themselves in sunny climates, or changing their colors to attract beneficial species and disguise themselves from harmful ones. They have evolved to withstand wind, heat, freezing, drought and floods. Until about a hundred years ago, plants were the main provider of food, shelter, medicine, and personal care for humans and animals. They are our best friends here on earth, and they continue to provide us with solutions to our everyday issues and problems. We as a company take the time to educate consumers on how we can all return to a more natural way of existence – living off what nature has traditionally provided us, and learning more about what will be beneficial to the planet and to humans as its caretakers. 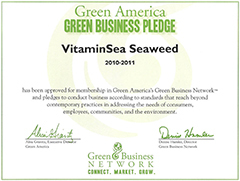 As of August 5, 2010 we were approved as a member of the GREEN BUSINESS NETWORK. To become a member, a business makes extraordinary commitments to fair treatment of their employees and workers in their supply chain, promoting healthy communities where they do business, preserving the environment, and delivering quality products to their customers. To recognize our commitments and accomplishments as a green business, Green America has created a Green Business Seal of Approval. This seal signals that we have passed Green America's screening process and have been admitted as an approved green business. We are honored to have become a member. 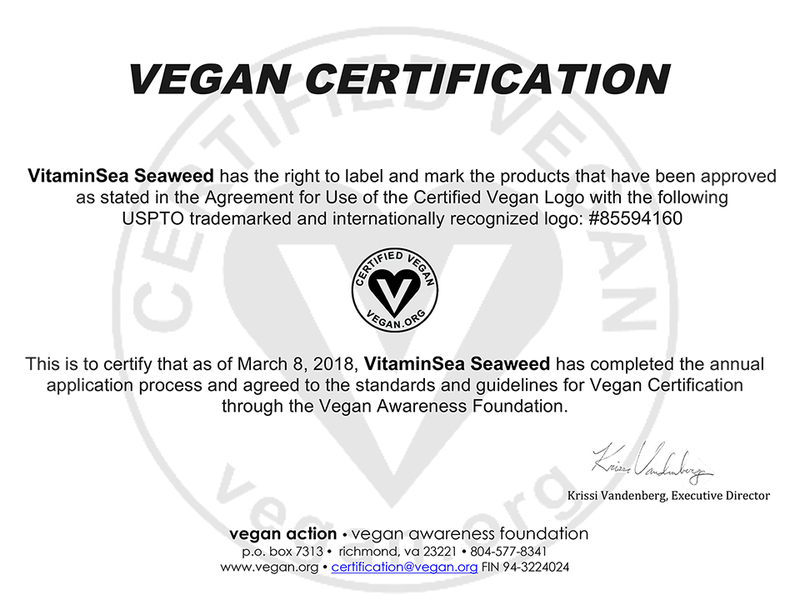 We are Vegan Certified! As of March 8, 2018 all of our products were approved as having the right to be labelled and marked with the Certified Vegan Logo. 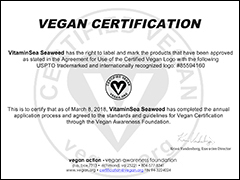 Standards and guidelines for Vegan Certification are through the Vegan Awareness Foundation. We are a sponsor of the Paul Parent Garden Club. Click the play button below to check out the video we were featured in from MPBN! VitaminSea Seaweed sells on Etsy. Click here to visit our Etsy shop.